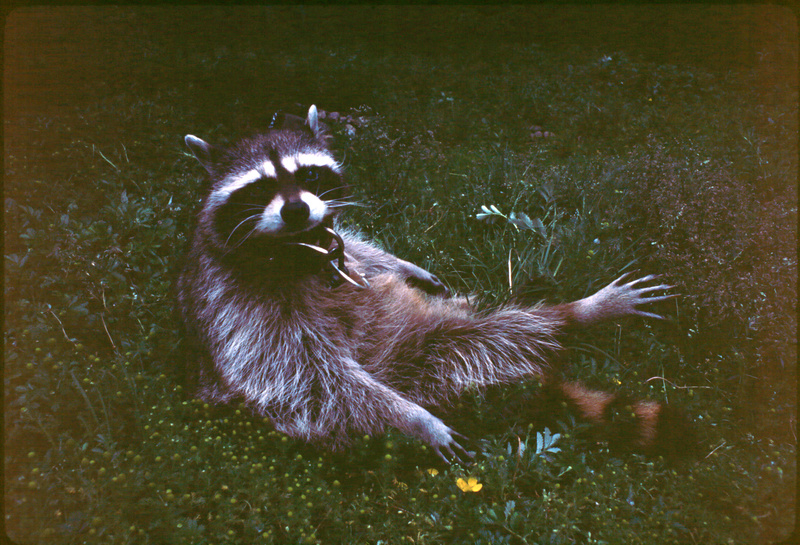 Home › pets › Rascal Raccoon has a Rocky Time! Rascal Raccoon has a Rocky Time! 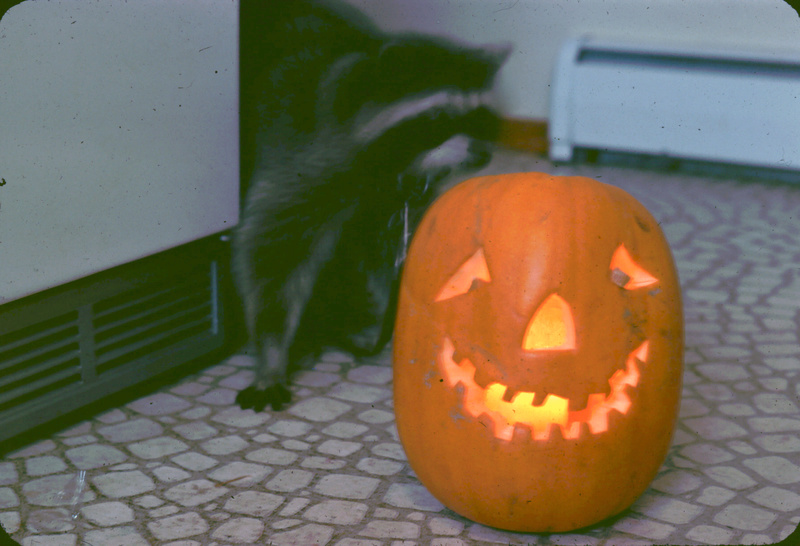 When I was a kid, in the late 70’s, I lived in Juneau Alaska with ‘Rascal the Raccoon’. My Mom rescued the little guy from a roadside ditch after she saw his mother killed on the highway. She often brought home lost or injured critters: birds, cats, snakes, and this time – a baby raccoon. She even got an official license to keep the raccoon from the local fish and game department and ‘Rascal the Raccoon’ was adopted into our family. He looks cute, but perhaps not the best pet? The problem was that ‘Rascal the Jealous’ thought my Mom belonged entirely to him. He was very envious whenever she paid attention to anyone else: my Dad, the cats, the turtles, even her kids. Rascal would flirt with my Mother and groom her hair with his little fingers every chance he got, but all he had for us was snarls and snaps. Not only could his needle teeth hurt—they did real damage and drew blood—but his little claws could cause you a great deal of pain. 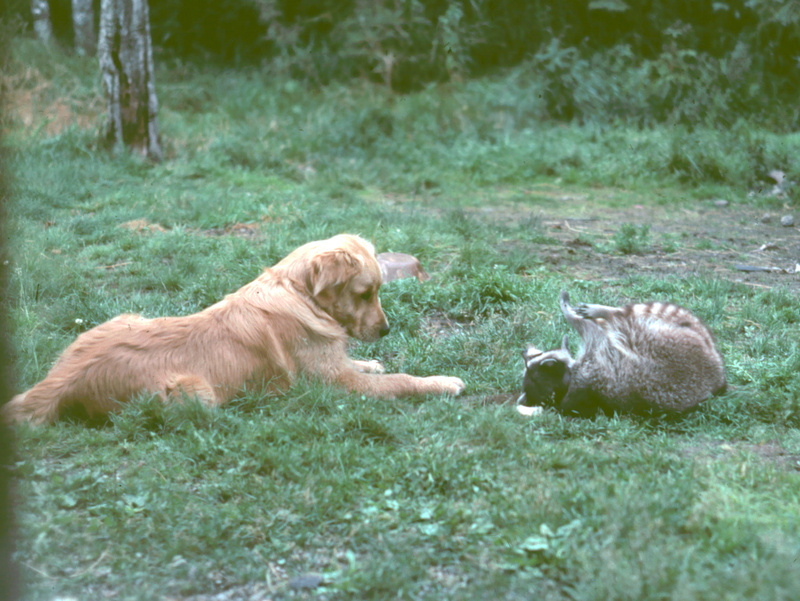 He was a bit of a bully… and I avoided getting close to ‘Rascal the Jealous’ whenever I could. In good weather Rascal was usually on a dog chain attached to the giant evergreen tree behind our house. He had his own realm, complete with an insulated doghouse and personal water pond. In bad weather, Mom sometimes let ‘Rascal the Cold’ in the house, to warm up and hang out, usually with her personal supervision. As long as Rascal had Mom’s undivided attention, he was fine…but the moment her back was turned, Rascal the Jealous was determined to scare us off. One memorable day my brother and I were home after school, waiting for my parents to return from work. We had a 15 year old babysitter with us—since I was nine and he was only seven—whose basic job was to keep an eye on us from 2pm or so until 5:30 when my folks would normally arrive. One of the babysitter’s other chores was to feed the dogs and she went out back to feed them – not closing the sliding glass door all the way as it was a beautiful warm day. Unbeknownst to her ‘Rascal the Clever’ had escaped his harness. Rascal snuck in while she was outside, and was on a mission to find the cat food (one of his favorite snacks). He snarled at my brother and me as he headed for the kitchen. We took off running for my brother’s room. We closed the door behind us, climbed up the ladder, and hid under a blanket on his top bunk – our safe place. We’d never had to deal with ‘Rascal the Invader’ without Mom around before. We screamed for the babysitter, and could hear quite a racket out in the kitchen. We later learned that the babysitter had tried to shoo Rascal out the door, banging on some pots and pans to scare him, but he wouldn’t go. He was intent on staying in the house where the kitty-food crack was, and he wasn’t about to be sent back outside. Hissing (yes, hissing) and snapping at her, ‘Rascal the Stubborn’ refused to exit, and the babysitter eventually gave up, closed the glass door, and came looking for us. She found us unwilling to leave my brother’s top bunk. She joined us, comforted us, and assured us that the raccoon wasn’t going to be able to attack us while we were in a room with a closed door. On the top bunk, together, we waited for Mom to get home. We kids were terrified and literally shaking with fear. Dogs and mom, those kids were competition! But he lived a long life! Raccoons are tough! In the ensuing two hours while we waited for my parents to return, ‘Rascal the Ravenous’ ate all the lovely kitty food, and went looking for more snacks. He must have smelled something tasty in the sofa, because he tore into it and pulled the stuffing out. He next slipped into my parent’s room, and discovered a bottle of children’s aspirin, which he managed to open with his dexterous little fingers. He then devoured most of the contents. When my mother arrived, she found her darling Rascal sitting on her vanity chair twitching, and staring confusedly at his own image in the wall mirror. Mom quickly realized what had happened, and took ‘Rascal the Sick’ to the vet, to have his little stomach pumped out—leaving my brother and me with the babysitter again. Unfortunately (or fortunately depending on your perspective) ‘Rascal the Drug Devourer’ survived his overdose, and lived many more years. I think he was fifteen when he finally passed on. Did I mention that the babysitter never came back to watch us again? Poor thing. I hope they paid her well. Val Riverwalk hails from the Pacific Northwest, and is absolutely enamored with wild places, critters and water. She spends every spare moment she can traveling to see more of the same. In some circles her nickname is Ms DoLittle because she is so nearsighted; her heart is a little naive, and animals generally find her company pleasant.